Tischblumenbilder (‘Tableflowerpictures’) reflects on the declension of adjectives in the German language (or as Mark Twain would say, ‘The Awful German Language’). It consists of words found in an instruction table that presented declensions of three nouns with adjectives. 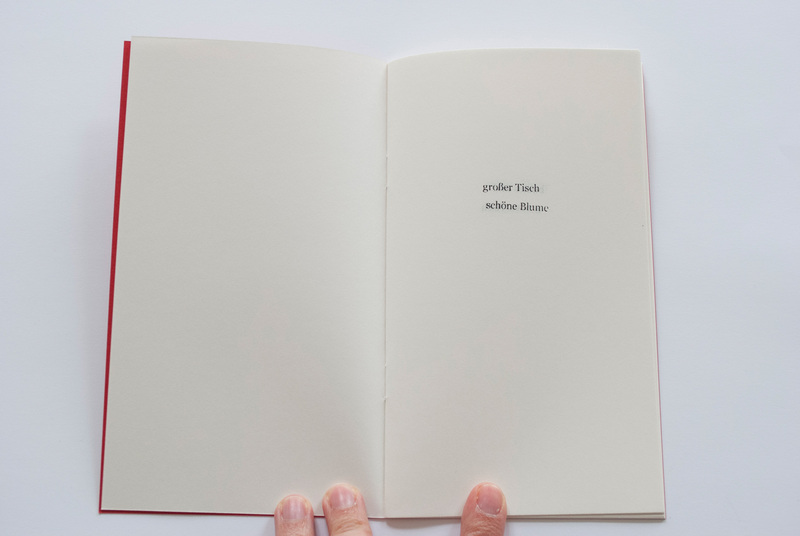 In the book these phrases from the table are stamped, causing fluctuations from phrase to phrase and from booklet to booklet, mimicking the constant (and to the novice learner bewildering) flow of word form variations that German presents due to the required identification of grammatical case, number and gender. The pairing of two phrases on each page also causes subtle shifts of meaning. Also see Mein Buch. The book is included in the collections of the Bayerische Staatsbibliothek, Bibliothèque Kandinsky (Centre Pompidou), Columbia University, Jan Michalski Foundation for Writing and Literature, Kunstbibliothek (Berlin), Mumok Vienna, National Library of The Netherlands (Koninklijke Bibliotheek), Zentralinstitut für Kunstgeschichte (Munich).